As a comedian and performer, Jordan Raskopolous does not suffer from stage fright, but away from the lights it’s a different story. In this compelling and funny talk, she shares her insights into what it is like to live with high functioning anxiety and how people like her can be perceived – to be both shy and loud at the same time. A talk many will relate to and one that offers strategies for dealing with it. 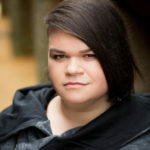 Jordan Raskopoulos is a comedian, musician and digital content creator. She is best known as the lead singer of The Axis of Awesome, a world renowned musical comedy group and YouTube Juggernaut. She is the creative director of Press Start Productions. Press Start is currently producing Insert Coin, an ongoing web series about video games. Jordan is also host of This is About, a narrative non-fiction podcast on ABC RN. In 2016 she came out as transgender in a viral video called ‘What’s Happened to Jordan’s Beard’. Since then Jordan has become an inspiration to young LGBTQIA+ people by living her genuine life, openly and publicly and using her platform and profile to promote awareness and understanding to a broad audience through humour.